This month the average 30-year fixed mortgage rate reached 5%, the highest since 2011. The rate trend appears to be heading up, as the Fed signals at least one more benchmark rate hike before the end of 2018. There is an entire generation of homeowners and homebuyers out there who have not seen rates at this level. So what will happen next? Zillow and other experts anticipate new homebuyers will need to spend on average an extra $1,416 per year on a mortgage payment on the same median-priced home vs. a year prior, limiting purchasing power and potentially dampening buying demand. Some jumped straight to predicting higher rates will trigger more home price cuts and lower home prices. Alongside rate watchers and housing experts, homebuyers have also chimed in. First, they expect mortgage rates to stay higher. 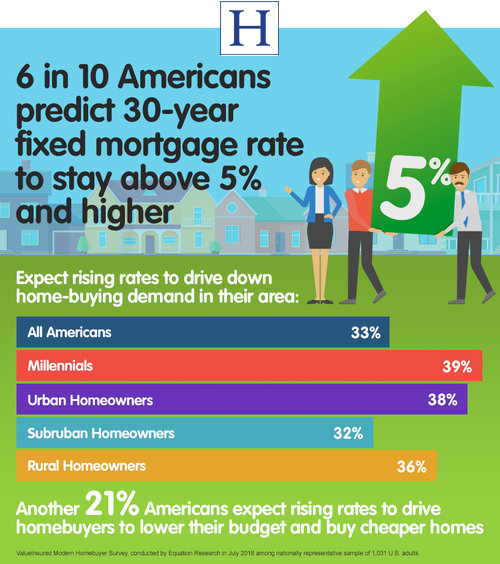 In the latest ValueInsured Modern Homebuyer Survey conducted in Q3, 2018, 6 in 10 homebuyers believe 30-year fixed mortgage rate will stay above 5% as they enter the new year; over 1 in 3 (37%) believe it will reach past 5.25% by the end of 2019. Interestingly, homeowners who have lived through higher mortgage rates before the Fed began its recent series of post-crisis rate cuts are more likely to predict higher rates beginning in 2019. Among all homeowners, 80% believe the Fed will raise benchmark rate again this year. 72% of them went as far as saying the era of low-interest rates and affordable mortgages are coming to an end. There is a sizeable group of prospective first-time homebuyers who believe rising rates will actually increase buying demand in the short term. 27% of all non-homeowners who wish to buy their first home in the near future say rising rates would make them more eager to buy sooner. They expect to tighten their spending further to buy as soon as possible without lowering their home-price budget; with their expectation that their monthly payments will be higher the longer they wait. Included content is intended for informational purposes only and should not be relied upon as professional advice. Consult with a mortgage professional to address your questions or concerns. This is an advertisement. Prepared 10/18/2018. Do You Have Questions About Rates, or Other General Questions?